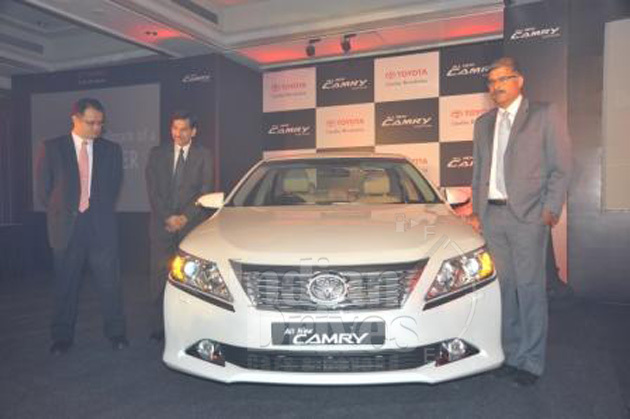 Toyota Kirloskar Motor has unveiled its all new Camry. The vehicle will be assembled in the various productionlines in the company’s second plant at Bidadi, near Bangalore. Camry, the legendary name for Toyota, was first revealed in India back in 2002, until now it was imported as CBU from Japan. The new model will represent the 7th generation of the Camry series. The new vehicle is powered by an all new 2.5 liter Dual VVT-I petrol engine that gives a maximum power of 181 PS at 6000 rpm and a peak torque of about 231 Nm at 4100rpm. The new engine is coupled with 6-speed automatic transmission with sequential gear shift. The all new Camry has been styled as the prestige sedan that could take on its core competitors. It offers the best in class cabin space primarily due to its impressively wide body and this super silent cabin helps in providing luxurious and quite ride. The new Camry is priced at Rs.23,80,000 (ex-showroom Bangalore) and is available in four exciting colors, viz white Perl, silver metallic, beige metallic and crystal shine. Addressing the press on the occasion of the launch, Managing Director, TKM, Mr. Hiroshi Nakagawa said that the firm is extremely happy to introduce the 7th generation of the All New Camry. These vehicles are the latest addition to their fleet of domestically manufactured vehicles in India. This shows the importance of the TKM in global growth of the Toyota Motor company. 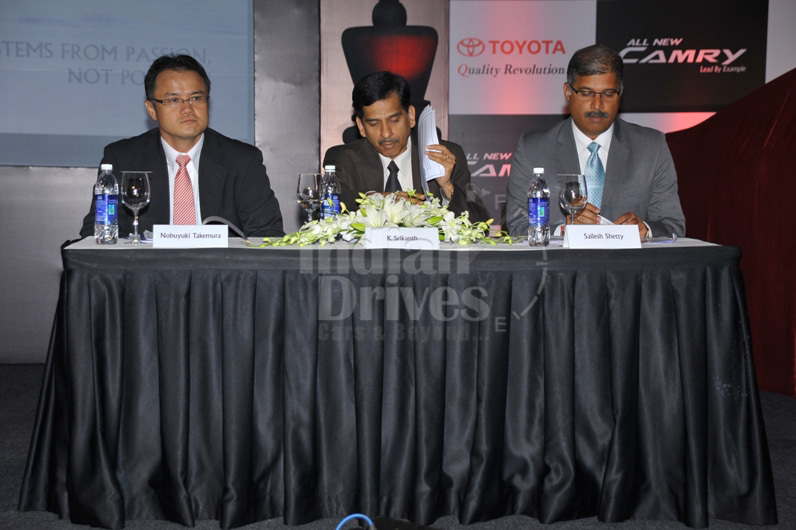 He also added that the new Camry is being manufactured in about 10 plants across the globe and TKM will be the 11th one. The production of Camry will mark an important chapter in TKM’s history. Deputy Managing director, Mr. ShekharViswanathan, added that with the domestic assembling of Camry in India, the firm will be further expanding its manufacturing operations in Bidadi plant. The expansion will come with an additional investment and revenue generation for Karnataka. He also added that the firm is quite happy with the local manufacture of this legendry model with the globally renowned quality. He also added that Toyota is further planning to revamp the capacity of their plant from 2,10,000 units to 3,10,000 units by 2013. Toyota Camry provides a blend of Luxury and styling at the same time. The fine toned chrome grille, elevated hood etc. complements its wide luxurious front design. The wedge shaped new design and the roofline with the sharp trailing edge towards the rear give it a distinct look. The car has blessed with various luxurious features like automatic HID headlamps with washer with the front fog lamps. The car also contains 16″ ten spoke alloy wheels and smart entry system along with concealed sensors. The interior of the vehicle has been carefully designed to provide enhanced sense of luxury and space that creates and extensive emotional appeal. The vehicle has been fitted with all the standard in-class accessories and equipment. The 8-way power adjustable driver seats with the lumber support, adjustable passenger seats with easy access buttons are few to be named. The seats and steering wheel has been crafted with pure leather and wooden finish. The steering wheel also hires multi-function buttons. The car also features smart entry system with start and stop button. The 6-inch touchscreen with the USB AUX, Bluetooth and car info competes for all your multimedia needs. The 2 zone automatic climate control and rear AC vents makes your ride more comfortable during Indian summers.